Cancer is a truly devastating human disease. There are about 200 different types of cancer – which can be subdivided into 5 different categories (carcinomas, lymphomas, leukaemia, brain tumours and sarcomas). It is highly unlikely that we would ever get a single cure for cancer due to the heterogeneous nature of the disease. As discussed in my previous blog post about how we develop cancer, in this post, I’d like to explore the idea of why we don’t all develop cancer. It is true that the risk of us developing cancer increases as we age. For most of us, cancer is an inevitable part of growing up. It is estimated that the probability of you developing a form of cancer by the age of 70 is 50% and as you age past 85, you are more than likely already diagnosed with cancer. But why does the incidence of developing cancer increases with age? It has been estimated that 300 hundred million of our cells die every minute while we shed and regrow every inch of the outermost layer of our skin cells every 27 days. In the average human body, there are approximately 37.2 trillion cells. If we were to lose 300 million cells every minute, it would take just about 86 days for us to have lost all our cells in our body and cease to exist. But of course, that doesn’t happen! We don’t just stop existing after 86 days. Our cells are in a state of continuous renewal. For every cell that dies, another would replace it. This process is known as the cell cycle, where a single cell replicates its DNA content and divides into two daughter cells. Typically, it takes roughly 24 hours for a cell to divide into two. During this process, the cell is required to precisely replicate its entire genomic content (all 3.2 billion nucleotides of DNA) in the exact same sequence each time! The enzymes used to catalyse this process, DNA polymerase among others, are not perfect. Every time a cell divides, mistakes in the form of replication error or spontaneous mutation in the DNA sequence are made. It is approximated that these enzymes make one mistake for every 100,000 nucleotides. Therefore, during a single cell division, 120,000 mistakes would’ve been made in DNA replication. With that said, all of us should be littered with cancerous tumours all over our body from the moment we are born! DNA repair to the rescue! Obviously, this doesn’t occur. One thing to understand is that most of the mistakes that occur could be beneficial or harmful, but largely the mutations do not affect our health and development. Our cells have devised a complex and truly genius way of counteracting the mistakes our enzymes make during DNA replication. This mechanism for DNA repair is vital in maintaining our body in a healthy state by preventing DNA mutations from accumulating over time which may result in cancer development). DNA mutations can occur via mistakes in DNA replication or from environmental factors e.g. UV light, smoke, alcohol or any other carcinogens. The DNA repair mechanism detects any error in the DNA sequence of a cell and corrects it with a high efficiency. If you would like to know more about DNA repair, please visit this link. All in all, about 99% of any DNA sequence error are repaired by this method. Still not 100% perfect however! 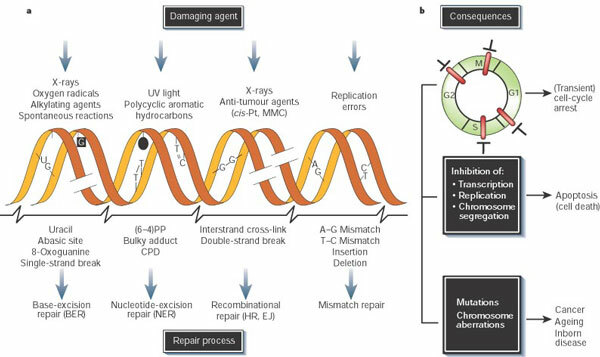 Common DNA damage sources including error in DNA replication, strategies used in the repair process to combat DNA insults and the consequences of DNA Damage on the cell cycle and in cancer development. (Nature Publishing Group Hoeijmakers, J. H. J. Genome maintenance mechanisms for preventing cancer. Nature 411, 366–374 (2001). Cancer has been around since the beginning of human life. It is a disease that has plagued human existence all this time. Therefore, I find it marvelous how natural selection has allowed the human body to develop a truly sophisticated way of combating this deadly disease. Great article. I think that you hint at a couple of very good points at the beginning of the piece which is that there is a general misconception that cancer is one disease and that people do not appreciate the inevitability of contracting some form of cancer as they age. Would be interesting to see some stats on the likelihood of contracting more benign vs more aggressive forms of cancer with ageing. Hey Jun-Ting, part (a) of the diagram describes the sources of any damaging agents that could result in an insult in the DNA sequence. The damage to the DNA sequence can be described in various categories e.g. single-stranded break, bulky adduct, double-stranded break or DNA bases mismatch. Therefore, depending on the type of DNA damage, the cell will employ specific DNA repair mechanism to deal with the issue e.g. base-excision repair, nucleotide-excision repair, recombination repair or mismatch repair. These are just the cells way of dealing with different types of DNA damage. Part (b) of the figure simply shows the result of DNA damage on the replication cycle of a cell, typically resulting in cell cycle arrest i.e. the cell will stop dividing or initiating a cascade of events leading to cell death. Usually, upon DNA damage, the cell goes into cell cycle arrest until the damage is repaired. If the damage can’t be repaired, the cell would simply commit suicide (apoptosis). If the cell failed to repair the damage and doesn’t kill itself, mutations in the DNA sequence can accumulate causing long-term damage to the body i.e. cancer or age-related diseases. Sorry for the long reply. It is quite difficult to describe the diagram in a more concise manner. If you’re interested by the topic, please do visit some of the sites that I’ve hyperlinked in the post.